These new Tungsten Line Guard Beads are designed for anglers to use directly onto naked main line. They can be fixed up the line for use with Naked Chod Rigs, and will slide down to the Heli Buffer Sleeve that sits over your lead once a fish is hooked. They have a handy tapered side that your swivel will sit on during the fight to ensure your naked line is not damaged when playing hard-fighting carp. The Line Guards can also be used on traditional helicopter style set-ups too and have been designed to sit neatly on top of the Edges Heli Buffer Sleeve. The tungsten content in each bead helps to pin them to the lakebed. 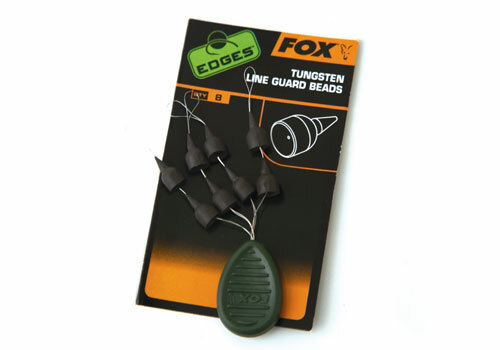 There are 8 Tungsten Line Guard Beads per packet each supplied on a wire loop.